Place pork in a large ziplock bag or baking dish. Pour 1/3 of bottle over top of meat, making sure to coat it (adding more marinade if necessary.) Marinate one hour or longer in refrigerator. Remove meat from fridge 30 minutes before grilling. Preheat grill over medium-high heat (around 425-450F.) Grease lightly with oil. Place meat directly onto grill and pour some excess marinade over-top if desired. Discard any remaining leftover marinade. Close grill and cook for 5 minutes and then flip, cooking for another 5 minutes. Keep rotating while grilling (trying to get all sides) until internal temperature reaches 140-145F, about 10 to 15 minutes in total. Use fresh marinade from the jar to baste the meat near the end of cook time for added flavour. Remove from heat and cover with aluminum foil. Allow to rest 10 minutes before slicing and serve. Drizzle with extra sauce if desired. Drizzle sliced bread with olive oil. Lightly brush pineapple slices, onion, and corn with oil and season with salt and pepper. Place everything onto BBQ over medium-high heat. The bread won’t take long, so watch carefully and flip when grill marks appear, about 2 minutes in total. Corn will take 10-15 minutes, rotating every so often to evenly brown. 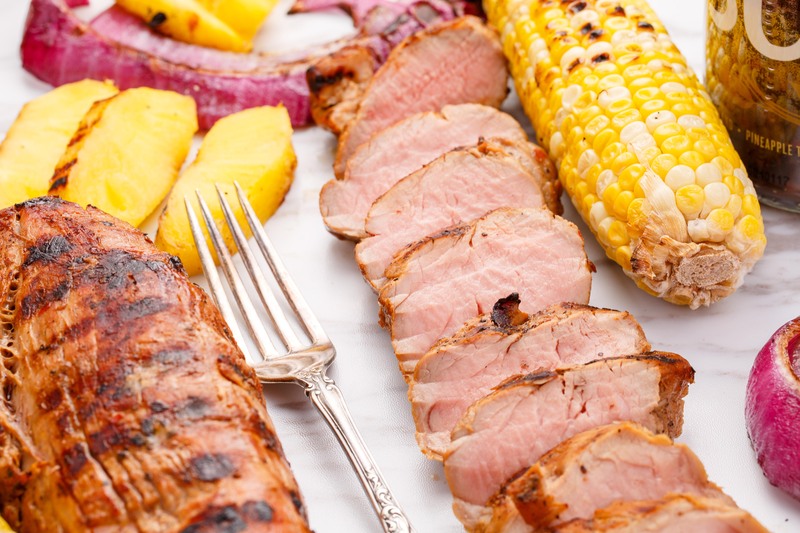 Pineapple is grilled 3-5 minutes per side, or until grill marks appear. Onion rings take about 5 minutes per side depending on thickness. Assemble all ingredients onto crostini for a fun summer appetizer, or eat the pork tenderloin on it’s own.